Whenever you’re feeling emotionally charged — sad, upset, angry, or depressed, instead of calling your friend to vent or grabbing that bag of chips to stuff your feelings, I want you to pull out your journal. You get to express all the angry and unreasonable thoughts and feelings without censoring, and you also get to hear the wisdom of your own wise self, which always shows up when you’re willing to turn inward. 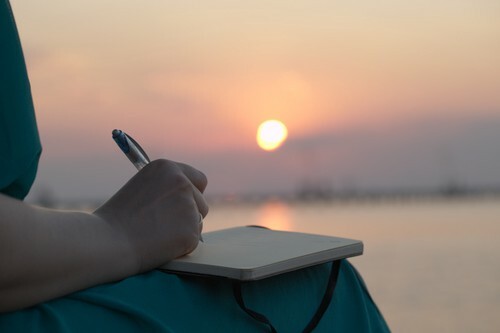 The experience of journaling comes in like waves — charged emotions, curiosity, inquiry, reflection, epiphany, insight, wisdom, release. When you’re willing to come face to face with yourself, wisdom always comes through along with compassion and love. Besides, in your charged state, you may say something to your friend you may later regret. Your journal is forgiving. It’s a no-censor zone. You can always burn the pages later, too! Don’t let anybody read your journal and hide it in a safe place if you’re worried that someone might read it. You want to be able to spill your guts out without the fear of someone seeing this uncensored “spillage.” So make sure you do whatever you need to do to make it feel safe for you to write your heart out. You’re not writing here to be graded. You’re writing for your emotional health. Let whatever comes out come out in its messy, misspelled, glorious forms. You can write in a what some people call “stream of consciousness” style and let whatever pops up in head appear on your pages. If you’re new to journaling, you may feel that you don’t know where to begin, and this way of writing may be really helpful to you. I’m not saying to punch your neighbor or curse at him just because you’re angry, but you can express it in a safe container like your journal in a healthy way. Enjoy reading this article? Please spread the love by clicking the ❤ below.